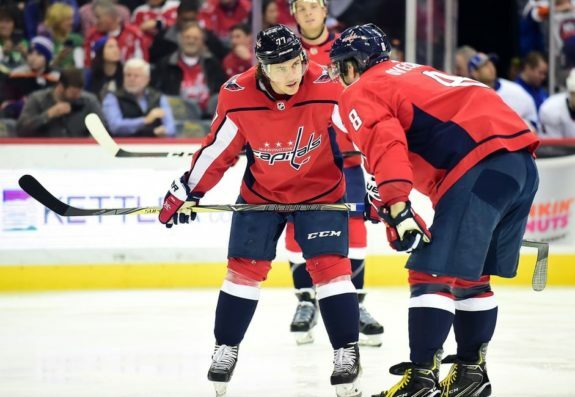 It was on his own bobblehead night at Capital One Arena that Washington Capitals winger T.J. Oshie found twine for the fourth time in four games, scoring on a quick pass from Lars Eller. As he skated to the bench, he celebrated in a similar fashion to his bobblehead, shaking his head around as he returned to the bench. While the nodding was an imitation of the bobblehead, it could also be interpreted as something of an affirmation: as the playoffs near, he appears to be regaining a step in his game, creating more offense and returning to form as a player capable of 20-plus goals per season. Oshie scored a career-high 33 goals last season, tying Alex Ovechkin for the team lead in goals. His hard work, as well as his positive energy and effort he brought on and off the ice and in the locker room, earned him an eight-year extension, one that he would want to prove himself worthy of heading into the 2017-18 campaign. However, after starting the year with 10 goals and 22 points, he fell victim to a concussion on Dec. 4, and since then, his production has seen a significant decline; he had only two goals through December and January, and went without a goal the entire month of February. 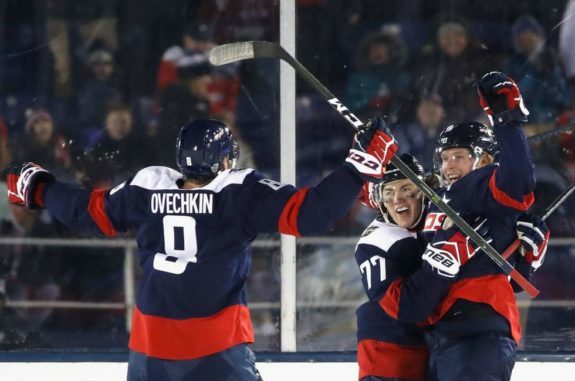 Braden Holtby agreed, saying that “sometimes, the puck doesn’t go your way,” but ultimately, Oshie is an all-around player and remains a top contributor, regardless of whether or not he’s putting up points. Heading into Thursday’s matchup with the Islanders, the 31-year-old hadn’t scored a goal in 19 games. He left Brooklyn with two. Just 24 hours later, he faced New York for the second part of their home-and-home series and struck yet again, igniting something of a spark. So far through March, Oshie has four goals and six points through nine games, as well as points in three of his last four games. While he wouldn’t affirm that he was necessary “back,” he did say that he feels his game improving and that he has a lot more energy and momentum of late. In Washington’s 4-3 win over Dallas Tuesday, Oshie said that he was able to make himself more prominent around the net and that he has been trying to create more space to get in the tight areas and create chances. He also attributed his success to his teammates. For now, Oshie seems to be regaining his touch and capitalizing on his opportunities, and as Washington makes its final push as the regular season winds down, he hopes that the team can finish strong and ready for a deep playoff run.